Do you want to save money during this weekend? If yes, this offer is exactly for you! If you are a Clubbebe Member you can get 25% discount on your purchase of $150 or more. 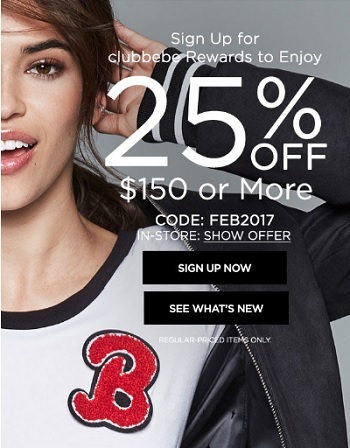 This offer is valid at U.S. bebe stores and bebe online. If you are not a Clubbebe Member you do not have to be sad. You can sign up here. To redeem in‑store, show offer at register. To redeem online, enter code FEB2017 at checkout. Source of the information is bebe. Offer ends on Sunday, February 5, 2017. More details available at any U.S. bebe store location or bebe official website. (total: 1214)G.H. Bass & Co.